Summer Holiday Family Fun at Lazer Planet! 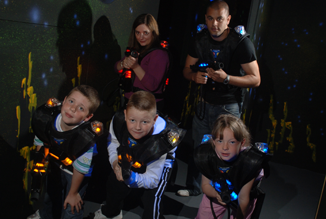 The schools are out, and the kids are getting bored, so treat them to Lazer Planet for some Summer holiday family fun! You can now play Lazer Planet every day over the summer for a reduced rate of £11pp for 3 game sessions. Featuring an arena that can hold up to 30 players, Lazer Planet at Clydebank really is the best action orientated game fum for the whole family! Located in the same building as Scotkart, we offer a competitive and enjoyable option to keep the kids amused. The centre is indoor so no matter what the Glasgow weather you can still come and enjoy lazer come wind, rain or shine! So why not have some summer family fun and come on down to Lazer Planet this summer!